Interested in a new phone? How About The ASUS ZenFone 2? | OhGizmo! Interested in a new phone? 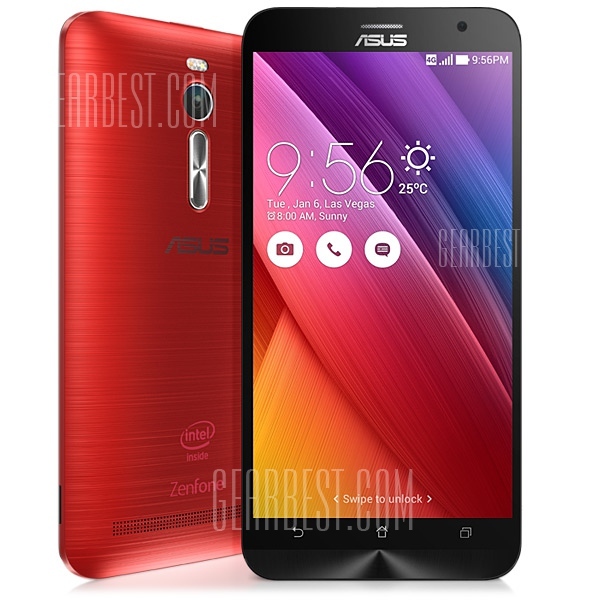 How About The ASUS ZenFone 2? By David Ponce on 04/21/15 • Leave a comment! ASUS has outdone itself again with their newest smartphone release. The ZenFone 2 features top of the line specifications for a middle-end price, making it a top competitor on the current smartphone market. Its display is based upon a 5.5” Gorilla Glass 3-protected screen with a 1080 x 1920 resolution. It is backed with Intel’s own 64-bit Atom Z3560 mobile processor that packs 4 cores clocked at 1.8ghz each. This is paired with a PowerVR G6430 GPU that is sure to be able to drive any mobile game or application smoothly. ASUS is releasing two models that have difference in the RAM including a 2GB model and a 4GB model. Due to these high-class specs, ASUS is claiming seven times better gaming performance as compared to the original ZenFone. Most smartphone users want a good camera to match their superior internal specifications, of course. The ZenFone 2 supports a 13-megapixel camera with 5 element f/2.0 aperture lens and a 5-megapixel front facing camera. All of these components are powered by a 3000mAh battery that is sure to last for the whole day. This phone is unlocked and is available on service providers all around by supporting GSM, WCDMA, and LTE-FDD. It ships with Android 5.0 Lollipop, providing the optimal software for the phone. This ensures a smooth interface that is sure to fit any user’s needs. An enormous benefit of this phone is a newly released coupon code. GearBest.com is offering a hugely decreased price of over $30. After making an account on www.gearbest.com and adding either the 2GB or the 4GB model of the ASUS ZenFone, users can specify the coupon code of “ASUSZ2”, which will then apply the promotion. Originally the 4GB model is priced at $367.20 and then is reduced to $330.74 (308.44 Euro) and the 2GB model is normally $288.30 and is slashed to $244.98 (228.46 Euro). Overall, the ASUS ZenFine 2 is one of the best smartphones on the market and is to satisfy the needs of even the most powerhungry user with the top-notch Intel Atom Processor and the large 3000maH battery. Paired with the low cost due to the promotion, this phone is a steal for the performance it will bring.